Job: Now I am a stay at home mom with a one year old daughter and a 2 ½ year old daughter. Before kids, I was a middle school science and social studies teacher and plan to go back in a year. 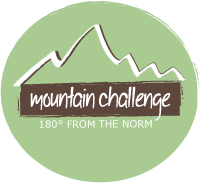 How you got involved with us: I was lucky enough to be the first Mountain Challenge Fellow. Most meaningful Mountain Challenge experience: I can’t pin one down. Each trip, training, or course helped build my character and filled my soul in different ways. I loved some of the trips like to the Ocoee with Big Frog Expeditions or Bike Alabama, but really sometimes the small things like teaching roll class at the pool or hanging out at the climbing wall gave me such a sense of community there at Maryville. How it influenced your career – I learned to be really comfortable in front of people and I wanted to work with people. Combine that with a love for science, environmental education, and hands-on- learning and voila, science teacher! A funny story: My entire freshman year! We were all figuring out what exactly I should be doing as a fellow and decided to start with being the gear lady. Somehow I always ended up getting gear ready and out of the chicken coop Friday nights with a headlamp on, but I loved it, it gave me a purpose early on in college. Anything else? I met my best friend, Marie, through Mountain Challenge. I think even as 31 (oh my god) year olds we still use many Mtn. Challenge philosophies to guide each other through hard times or questions in life. Like “Are you feeding the rat?” or “What’s your five year plan?” or even “Do you love what you do?” It has been a compass for me over these years and will always be.